Australia is our passion. We love products that are useful and environmentally friendly. We are always striving to create new and functional products that combine our love of this country and our love of enjoying the simple things in life. Our latest product launch is especially for the quieter moments of the day, when the time comes to relax and enjoy dusk and evening. From our Australian souvenirs range comes our adorable Koala Candles in two must have scents; Strawberry & Vanilla. Light me to ignite your travel bug and remind you of the fun you had in Australia! Made from 100% Paraffin wax. 40 hours burn time. The act of travelling encourages us to think outside the box; explore the country and visit places you have dreamed of, engage with the local cultures, and most importantly enjoy yourself. These are the times that you remember, under the flickering light of a beautiful strawberry or vanilla-scented koala candle. Comes packaged in a beautiful recycled cardboard box, making it an ideal gift for yourself or someone special. Approx Candle Dimensions: H11 x L10.5 x D7cm. Head on over to e3 Products to explore the new Koala Candles, and our complete range of Australian-themed gift ideas. Did you know that Koala’s eat, sleep and breed in eucalyptus trees? Eucalyptus trees are vitally important to the distribution, abundance and wellbeing of contemporary Koala populations, and this is also where bees collect the pollen and in turn pollinate the flowers to bring you delicious honey and good health. At e3, we make Products With Passion, and none moreso than this.. Koala Bee Honey is harvested from Koala habitats in the eucalyptus forests of Victoria, and is now available to you to enjoy daily. Bees are barometers of the health of our world - we are partnering with organisations to help save the bees. What is most disturbing is that Koalas and Bees are both threatened in Australia. We want to help save our planet, so we have partnered with and donate 5% OF THE SALE OF THIS HONEY to Save the Bees and the Australian Koala Foundation. Please visit these links to learn more, and see what you can do to improve their plight and secure the future of these animals and, of course, honey. Did you know that Eucalyptus Honey has Probiotic Qualities? Australian eucalyptus honey has probiotic qualities, and with regular consumption can improve gut health by promoting the growth of beneficial bacteria in the large intestine. Honey is also beneficial for colon issues and IBS. This is done through the naturally occurring active ingredient, Oligosaccaride. It also suppresses hay fever, sinus allergies and improves disease resistance through increased antioxidant levels. Swallow a teaspoon of honey to reduce sore throats and ease a cough. You can read more about this research by clicking here. This product contains no artificial colours, preservatives or flavours, just….100% Pure Australian Honey. Koala Bee Honey is Organic, Not Heat Treated, Lasts 30+ years, and is Antibiotic free. It is best enjoyed in tea, sandwiches, on cereal, or straight out of the jar! Add some Koala Bee Honey to sweeten your favourite tea. Use our Koala Tea Infuser with easy opening loose leaf tea infuser to make tea time fun. Hope you have enjoyed this (sweet) post about a very important topic. Head on over to e3 Products to explore our complete range of Australian themed souvenirs, keepsakes and gift ideas and pick up a jar of delicious Koala Bee Honey. There are few national events as iconic as the Melbourne Cup, and last week it was again run and won. At e3 HQ, we even had the buzz of knowing some of the local owner's of winning horse Almandin in our hometown of Torquay, and that's probably the closest we'll ever get to the epicentre of the race! As iconically Australian as Vegemite, Phar Lap and the Great Ocean Road, the Melbourne Cup is part of our culture - we love celebrating everything about Australia's DNA, and sharing that with the world. There's nowhere else in the world like Australia; The 12 Apostles, Great Ocean Road. Australia attracts millions of visitors annually from across the globe, and us 'locals' have a good habit of travelling within our land too and playing 'tourist'. We immerse ourselves in other's backyards, finding 'beauty rich and rare' in new places that form a tapestry of memories of this land we call home. As Australian's, we can only imagine what experiences, snap shots and memories our international guests take home with them of their stay here too. 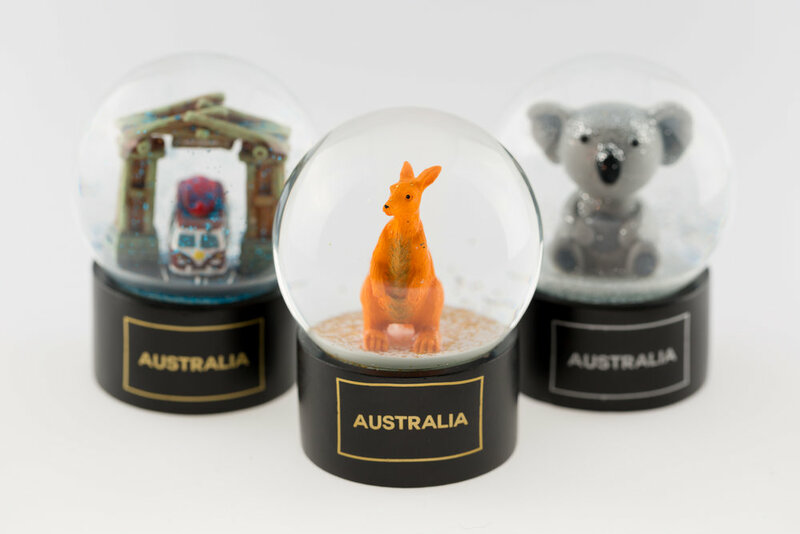 After a breathtaking experience exploring Australia's sights and scenes, take home one of these Waterballs to remind you of your fun times exploring Australia. Can you imagine the impressions that are made by seeing stunning natural environments like the Great Barrier Reef or iconic landmarks like the Sydney Harbour Bridge? Or sighting our national Australian animals like koalas, kangaroos and wombats in the great outdoors or a wildlife park? We have a diversity of landscapes that are unrivalled and we know there's nowhere in the world like Australia. Our range of Australian souvenir products represent our unique environment, and remind people of the places they visit and adventures they've experienced. So whether you are a visitor or a local, we've got something for everyone. Head on over to e3 Products to explore our complete range of iconically Aussie gift ideas.